Wellington Chase was developed during the early 2000s as an addition to the growing number of Palmer Ranch master planned communities. Single family homes comprise this non-gated community on Northridge Road, which is just south of Clark Road—a main thoroughfare in southern Sarasota and the location of several commercial establishments. Wellington Chase real estate owners enjoy two great aspects of a Palmer Ranch community: attractive residences built around thick nature preserves and tranquil lakes—with low HOA fees. Although not a maintenance-free community, residents nevertheless enjoy pristine surroundings and beautifully maintained homes. In essence, Wellington Chase real estate is everything a Palmer Ranch real estate is. The price range for Wellington Chase homes for sale can go from the low $200s to the mid $300s. Floor plans range from 1400 to 2600 square feet. There are two to four bedroom units, and a garage for two cars. This community is the best option for families with growing children, although some of the residents are retirees. Sarasota has some of the best schools in Florida, and Palmer Ranch is zoned for the Sarasota County School District. The Imagine School, a charter school on McIntosh Road, is a short distance west of Wellington Chase. Pine View School, a prestigious school for intellectually gifted children, is a few minutes’ drive south. As for recreation, Livingston’s Amusement Center on nearby Clark Center Road is open daily for billiards, go-kart, wall climbing, arcade games, and the newest gaming craze—the phazerzone. Livingston’s also accepts birthday parties and team buildings, so Wellington Chase residents who need an awesome venue for a fun-filled event need not look far. In addition, Sarasota is home to a number of educational parks and museums, including the Sarasota Jungle Gardens, G. WIZ Science Museum, and the Mote Marine Laboratory. Each offers a refreshing approach to learning and caring for the environment. The YMCA on Potter Park Drive is best for fitness and recreation. Children and adults can participate in a variety of sports and development programs. The ultra-modern fitness center is something to brag about, too. Moreover, kids will definitely enjoy the aquatic center across the street. These attractions and facilities are only few of the offerings within close proximity to Wellington Chase. There is so much more to be enjoyed for residents of this community, and all are guaranteed to make owning this Sarasota real estate the best experience possible. 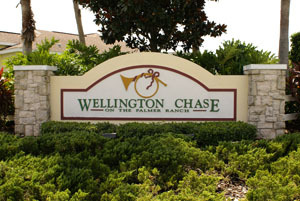 Below are all the real estate listings currently for sale in Wellington Chase on Palmer Ranch.